Grow your business with our Web and Mobile ready platform. Hassle free ordering combined with power of customization! 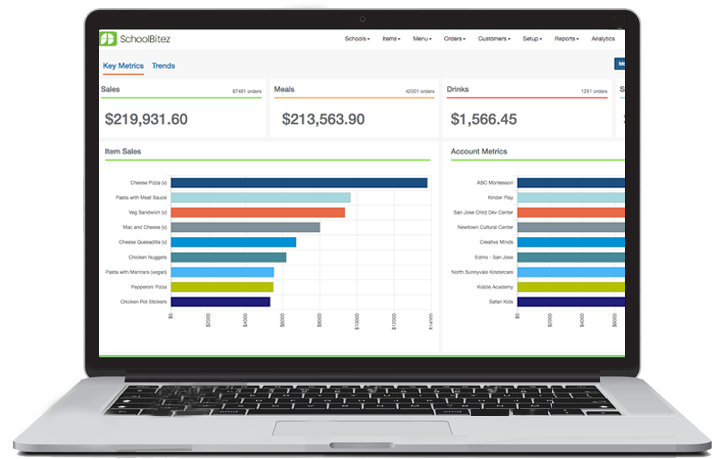 SchoolBitez offers school lunch providers/ caterers a rich set of tools to easily set up and manage online ordering. Cateres can manage hundreds of school menus with shared menu templates to save tens of hours and can get up and running with in minutes of sign up. Parent love the freedom of ordering from their mobile phones using our Android and Iphone apps. SchoolBitez also offers unique features for caterers who service Summer Camps and Day Cares, including advanced cart options and order cut offs. Our School Admin portal allows school and camp administrators to run their own reports and view School Menus to self manage parent inquiries. Our platform allows vendors to organize all menu options with an easy to operate drag and drop menu builder. Our system remembers every child's favorite meals, shedding off valuable time from your ordering process. We give multiple payment options for a seamless and secure checkout. We offer vendors concise business reports and insights, allowing you to enhance your customer's experience. Flexible pricing options for your menu. Configure prices by school or by portion size. Caterers can set up advanced configuration for their meal programs to Summer camps. Customize the store cart to let you invoice the school instead of parents paying for their lunch orders. Our Mobile app is available for IOS and Android devices. 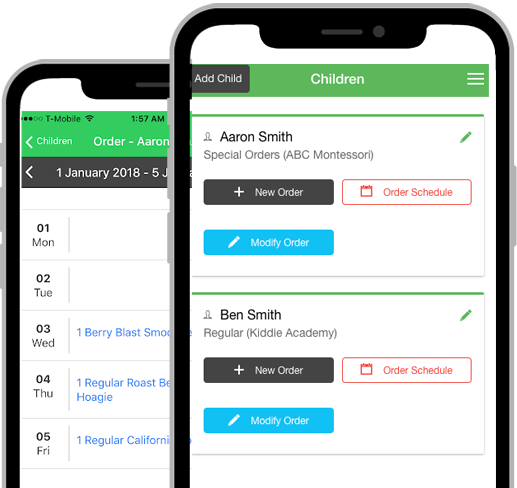 Parents can place new orders and manage existing orders using our app. Use our app's notification feature to remind customers about ordering deadlines. Advanced reporting lets caterers generate production/ operational reports. Reports available in both Excel and PDF format. Just a few clicks, and lunch is ready! You can stop wasting hours of time on the phone with lunch providers just to be able to get a simple school lunch. SchoolBitez makes it a breeze to set up an account, pick your favorite local caterers, order the best meals and make secure payments all in one spot. SchoolBitez allows you to get noticed. Our customizable shop options allow you to brand your business and reach more school clients. All you have to do is set up shop, build a menu and watch the orders pile up. Forget the endless paperwork. Fresh school lunches are only a few taps away. Our easy to use mobile app makes us the ideal option for schools and caterers. All of our advanced features can be operated right from the palm of your hands. Less than 10 thousand meals a month. 10-50 thousand meals a month. Still got questions? Give us a call. We'll give you the full tour of our system, our prices, sample shops and the entire user experience.